Much has been written on the “Davos Effect”, where the musings at this annual event from senior executives of large companies such as Google and Sony actually become true, or at least offer a window into the current thinking or focus of a particular company or industry segment. 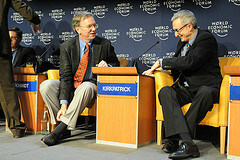 By now, many of you will have read the summary of the panel session at Davos chaired by David Kirkpatrick of Fortune Magazine consisting of Kevin Martin, FCC Chairman, Howard Stringer, Sony CEO, Jeff Zucker, CEO of NBC, Universal, China Mobile CEO Wang Jianzhou, and Eric Schmidt, CEO of Google. You can watch the panel session on YouTube. If we take the Davos effect at face value, then the statement by Eric Schmidt at Davos that “The arrival of a truly mobile Web, offering a new generation of location-based advertising, is set to unleash a “huge revolution”1 is significant on a number of levels. Schmidt went on to say “It’s the recreation of the Internet, it’s the recreation of the PC (personal computer) story and it is before us — and it is very likely it will happen in the next year”. I have been looking at the parallels of the Internet 1.0, launched all those years ago in 1994/1995 when internet access was just becoming available to the average user, rather than restricted to universities and the military. Given I was probably one of the first power internet users, I have been looking closely at how the concept of web advertising evolved how we can apply it to the mobile web 2.0, to see if we can learn from the mistakes made and accelerate the development and adoption of the mobile as a platform for advertising. If as an industry we get it right, there is revenue available for all players in the ecosystem from operators, to 3rd party players, and of course for the agencies and brands we want to use this new and very powerful medium. What we are seeing with mobile in 2008 are the same issues faced back in the late 90’s – how to make money out of a medium that is somewhat restricted (screen size, processing power, available bandwidth etc) – er….haven’t we heard all this before?? The fact that the CEO of Goole says proudly “It’s the recreation of the Internet, it’s the recreation of the PC” makes us all sit up and take notice, but the real question should be have we taken all of the innovations and mistakes made with the original concept for web advertising and are we ensuring we don’t make the same mistakes in mobile. The answer is probably no. We know so much now about user behaviour, creative that works and doesn’t work, spam, frequency, reach etc etc – but the question remains – how do we apply this to mobile? Many of us in the industry are paid to research, evangelise and even deliver the answers to these questions. So, coming back to the title of my post – will the musings of Eric Schmidt and others at Davos on mobile advertising and the mobile internet change anything – than answer I believe is most probably. Google have already started to back the concept of non-GPS location on mobiles. Their My Location product that I have extensively blogged on recently seems to be working well in the beta phase, and I would expect that the initial results are promising, and those folks at Mountain View are busy working on the next version. There are key issues to be overcome to allow location to become mainstream on non-GPS handsets – a subject discussed at length in my earlier post It’s not just privacy concerns preventing mobile advertising from taking off. Firstly – who owns the customer relationship? If we assume (as it was Eric’s analogy) that it is Google – then how do you know I had a Pizza yesterday? Was it because I was near a Pizza Hut for long enough to have dined there and my mobile automatically detected this, or is there some other information sharing going on here.Let’s assume it is the former. With today’s available location technology (and I am discounting GPS enabled handsets because consumers don’t always have the GPS turned on because of battery drain, and also GPS doesn’t work indoors – ie inside the Pizza Hut) there is only one real alternative for mass market location and that is network cell-ID. The issue here is we are not solving a location problem – we are solving a zone detection problem (different challenge) – ie did I venture into the Pizza Zone yesterday or not. The most efficient way to do this is via zone detection and not with pure location. Moving onto the next point – “there’s a hamburger stand on the right” – again this is not a location problem but a zone detection one. Eric – please have one of your team contact me to explain the difference in more detail. Mr Schmidt is right that location-based advertising will be a very good business and useful to the end user – if executed properly. The main reason why LBS has not taken off is that there has been no efficient and cost effective middle ground location solution in-between Cell-ID and GPS available for the mass market – until now. Please contact me for more information on why I believe this to be so. Schmidt was upbeat about the changing industry, predicting “a huge revolution.”My View is that Schmidt is right – if we look at the lessons from the “traditional internet”, and apply these to the mobile internet AND inject the issues specific to mobile in the mix. 1. Flat rate data plans for all – prevent bill shock for users who have downloaded some great ad but been charged for the pleasure. Flat rate data will also allow users to start using the mobile internet on a daily basis – making it an extension of their desktop experience. Compare this with flat-rate broadband plans – who still wonders if they will go over their monthly allowance while watching YouTube videos? If we expect mobile internet adoption, we need to price the data plans so that they are generous and within reach of the average subscriber. Only then will adoption increase exponentially. Remember SMS? Why did it take off in GSM countries like Europe, and Asia? Because it was easy, it came pre-loaded and it just works. UK operators have started offering flat rate plans – see Will the 3G mobile broadband “dongle” kill the WiFi hotspot market? 2. Common framework for mobile page rendering and addressing – get this right and non-tech users won’t have to even think about which web address they put in to their phone (see my post m.dot or dot.mobi – which mobile website naming convention will prevail?) Having one web address for the “mobile” site like m.twitter.com or m.live.com etc means the consumer has to think before they type. Make it easy (see my SMS example above) and the average non-tech user will adopt it. If they adopt the mobile internet, then the path is clear for mobile advertising to take off. 3. Mobile location without GPS, and zone detection – big call here and there are a number of players including Google working hard on this. There is also a role for the mobile operators to play in this space as they own, and update the actual cell-ID information that others need to use to make sense of handset location. Location has typically been very hard to get right, with issues around accuracy, and the cost of the location. For network based location, each location “ping” consumes the same resources as an SMS – and it must be charged by the operator as there is an opportunity cost (ie if I located someone, I could have used the same resources to send an SMS so I need to charge like an SMS – which is a few pence/cents wholesale rate). This means that mass market “polling” of a subscriber’s location will never make financial sense. Google have managed to work around this by having the handset perform part of the location decision, but this still requires a massive database to be updated. It also assumes the user has the Google Mobile Maps application on all the time and configured for this to work. There is a huge opportunity here to make the process seamless and work cross-carrier. Watch this space – this is the key to location and hence mobile advertising as Eric Schmidt rightly points out. 4. Customer profiling – working out how mobile operators sensitively profile users and serve up ads that are entirely relevant. This is a big one. I am a Vodafone UK contract customer. Only Vodafone UK know I am a 39 year old Male – and my home address. They know how often I call, and who I call, who calls me, and where I call from. They even have a better idea than my wife of the destinations I roam to. This information is gold dust to an advertiser (if I allow it to be provided). The portals won’t ever have this relationship as I don’t pay Google a cent so they do not have a commercial relationship with me. MVNO Blyk has started in this area and initial results are promising with their unique approach to profiling and targeting. The issue here though is that even if I was entirely happy for Vodafone to use my profile to more effectively target ads to me (and provide me a benefit in return – I will leave this subject for a follow up post), the data protection (privacy) laws in the UK and probably many other countries prohibit Vodafone from sharing this information with a 3rd party – it is private and should stay within their network. Here lies the problem. If mobile advertising is to be successful, then demographic profiling information (including past and present location) must reside on the carrier side – which means that they must also (and are best placed to) provide the search engine. Expect a showdown between some of the portals and the operators once the real revenue opportunity becomes evident for mobile advertising. “It seems obvious that advertising, that works so well on the traditional Internet, should also work well on the mobile Internet,” Schmidt said I have addressed the key learnings from the “traditional internet” above in the first part of my post – we’ve all been here before. Let’s not make the same mistakes twice. But Schmidt said the estimates would be adjusted upward once the business reaches a “tipping point,” which will be ushered in by new technologies. “We need to create that framework in which the really creative people can build (mobile) applications that none of us can even imagine. That is the recreation of the Internet, the recreation of the PC story and it’s very exciting. It’ll happen in the next year. It will be big.” With these statements, I can only agree with Eric Schmidt. Make the ads not look like ads – get creative and have a product, service or content recommended in a similar way that social networks recommend things. Traditional ads on TV and the internet don’t always translate to the small screen. Many companies such as Amobee, and Admob are working hard in this area. Kevin Martin, chairman of the U.S. Federal Communications Commission (FCC) “It does raise significant privacy concerns,” agreed Kevin Martin, chairman of the U.S. Federal Communications Commission, which regulates the industry. Privacy and location go hand in hand. The end user wants to have full control over the provision of the location information – and I fully agree. The example with the Pizza and the Hamburger above could only be realised if I had explicitly allowed my current and past location to be made available to some company with which I have a relationship. Privacy and consumer trust is absolutely key here. Get it wrong and the whole model will fail. Wang Jianzhou, whose company is the largest mobile provider in China, noted China boasts a half billion mobile users and is adding to the number at a rate of 6 million per month. The future, he said, was with “location advertising” enabled by the devices’ global positioning system. I slightly disagree here. Assuming all users have a GPS enabled phone is one thing, but GPS use quickly drains the battery (I only get 3 hours usage on my Nokia 6110 Navigator with the GPS on) so subscribers will disable the GPS feature if it restricts the normal usage of the phone. Secondly, GPS does not reliably work indoors. Last time I checked, shopping malls were indoors – so if a subscriber goes undercover with a GPS phone as the only way of detecting their location or zone status – there goes a sale. Mass market location solutions will not grow based on GPS alone. At a minimum, a hybrid solution will be required, and for the billions of non-GPS enabled phones, a different approach will be required. So in summary – watch this space – 2008 will be a big year – Eric Schmidt said so! Update 1: I watched the whole 75 minute panel session on YouTube and it was the questions at the end of the session from the floor (not reported on the wires) that were also very interesting (everything from why carriers aren’t using AdMob through to a question about smell technology in mobiles). It was interesting also to hear the panel discussion in context (compared to what was reported on the wires). What was reported was a small section of the whole panel, but the reporters I think managed capture the key issues. Update 2: Peggy Anne Salz has updated her excellent msearchgroove.com site with an article that references the Davos panel session – Talking About A (Google) Revolution: Location-Based Advertising Gets Ready For Prime-Time; But Can’t We Do Better? Post Script: When I was studying for my Master of Engineering Degree in 1994, I had access to the open internet (4 years before Google was born) and wondered back then what would become of “the internet”. If you want to have a trip down memory lane, visit www.archive.org where they have cached pages from the early Google project at Stanford University back in 1998. Howard Stringer was more skeptical, saying young users of mobile phones don’t like advertising. Before we start looking at mobile data lets look at mobile phones. The real issue is that the screen despite being colour the quality is poor compared with the one I am using to write this on. It is not just a question of size, its a question of lack of 3D functionality. Once we can experience the mobile web in the same way as we do the fixed then we can start looking at the relationship that we have with the service providers. I think that that the big enabler for the mobile web will be the billing relationship. When you look at Mobile music what you see is that revenues are far greater than those of iTunes this is because everyone with a mobile has credit on the phone and does not need to enter payment details when buy content. The interesting fact about mobile is that we tend to use them when we are not mobile. Nokia say that 70% of mobile calls take place in a building. Therefore the potemtial for the mobile web is a lot more limited than the fixed as for the majority of the time the user has the option of viewing the web on a better device with a broadband connection. The problem I have with a number of those who are developing mobile web solutions is that they are attempting to take the fixed web and squeeze it onto a mobile device. I think that does not reflect the relationship that people have with their mobile and just what they might try to do. All you have to look at is a service such as Shozu which shows that some that takes the mobile experience and moves it onto the fixed web is more successful than something like Yahoo!Go which attempts to go in the other direction. I personally think of the 4 key issues needed to reach the tipping point for mobile Internet use, points 1 and 2 are most important. While points 3 and 4 are nice-to-haves, that could make mobile Internet usage even better than on the wired Internet, they will by no means incite users to use the mobile Web more frequently.